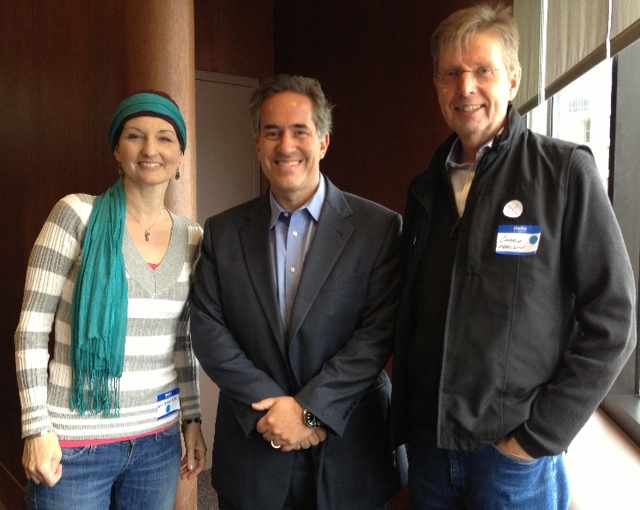 I recently had the pleasure of attending a myeloproliferative neoplasm town hall-style patient meeting at M.D. Anderson. I had known about the meeting for some time, but had dismissed the possibility of attending for two reasons: 1) I live three hours away from Houston and my husband and I have spent far too much time away from our children traveling back and forth to M.D. Anderson for appointments, tests and treatments, and 2) I am only six months past my second stem cell transplant and I’m still fully immunosuppressed. Sitting in a crowded auditorium didn’t seem wise, or likely. I had appointments in Houston the Monday prior to the meeting, and left feeling great about the fact that my myelofibrosis remains in remission. Certainly anybody reading this knows that MPN fact-gathering becomes sort of a hobby among curious patients who wish to be informed and involved in their own treatment. We want to understand our complex and rare diseases, especially when so many of us have encountered non-specialized medical professionals who simply don’t know what to do with us. Additionally, meeting other people who share our diagnosis is a rare opportunity, so I decided that I could not miss this meeting. I have learned little tricks that allow me to stay safe from germs, while still getting out of my house. So, we packed up and drove. I found seats on an aisle slightly separate from the rest of the crowd. And I washed my hands a lot. 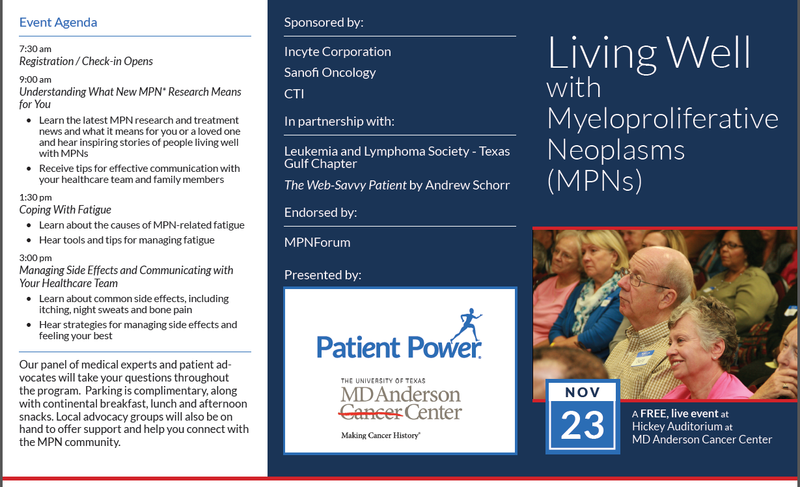 Charlie Nielsen, fellow MF patient and Founder of “MPN Support Texas” planted the mental seed that led to this gathering of experts and patients during an appointment with Dr. Verstovsek. Dr. V. agreed that a meeting like this was a great idea, and connected with “Patient Power,” which made it happen. The meeting was attended by over 150 people. We all wore color-coded name tags that corresponded to our specific diagnoses so that we could recognize each other and connect on issues that we might have in common. I was struck by the warmth of this group of people, all eager to connect with one another, listen and learn. The physicians and other panelists were also very friendly and accessible, chatting with patients during breaks and answering questions, quick to laugh, and eager to help. The meeting was split into three sessions over the course of the day: 1) New MPN Research, 2) Coping with Fatigue, and 3) Side Effects and Communicating with Your Healthcare Team, with plenty of time for Q&A after each session. Panelists of patient advocates and members of the healthcare team (a Physician Assistant, a Social Worker and an Internist) also added layers of perspective. Overall impressions from the day: Research is progressing rapidly and we are on the cutting edge relative to new and improved treatments for MPNs. We have much to yet learn about disease progression, new drug treatments, new uses for existing drugs, and treatment safety, and yet these things are all improving and expanding rapidly and providing hope for the future. Dr. Cortes spoke of SCT, explaining that there are many factors used to assess risk to determine whether it is an appropriate option for a particular patient. He went on to emphasize that transplant is not just a last resort treatment. Dr. Verstovsek (who attended via video as he was traveling in Europe) said that medications are often able to make patients who are not eligible for SCT, eligible for SCT, which in turn increases the cure rate. Important personal realization of the day: I was a little surprised by a conversation I had with a fellow MF patient during one of the breaks. She asked me about my SCT and then asked, “So, I guess we will be losing you from these meetings, then?” I told her that, no, I have no plans to give up my interest in research, treatments, and connecting with other patients. MPN will always be a part of my life, despite the fact that these days I think of myself more as a stem cell transplant survivor rather than a myelofibrosis patient. I have every reason to believe that this remission will stick, but my doctors made it clear prior to my second transplant that my primary challenge will always be preventing the disease from coming back. Perhaps more importantly, the communities of people who endure MPN are very dear to me. I’m sure we have all had some dark days when it seems like nobody understands what we are living with, but then I turn to the MPNForum Facebook page or a gathering like this one, and I am quickly reminded that I am not alone at all. * Kathy Dubin Flynn is 48 year-old myelofibrosis patient at M.D. Anderson and an active member of the MPNForum Facebook group. She has had two matched unrelated donor stem cell transplants (9/27/2011 and 5/17/2013.) 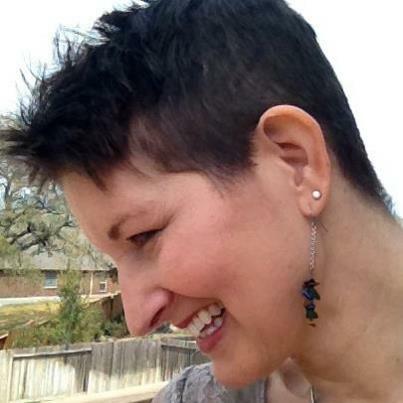 Kathy is happily 100% donor cells, JAK2 negative, and in remission. © Kathy Dubin Flynn and MPNforum.com, 2014. Unauthorized use and/or duplication of this material without express and written permission is prohibited. Excerpts and links may be used, provided that full and clear credit is given to MPNforum.com with appropriate and specific direction to the original content.